When a company is thinking about its online sales program, it rarely considers the platform from which sales are generated. Most companies often assume that their online sales come from desktop computers or laptops, while smartphones and tablets are just used for browsing. However, as the world becomes more mobile-reliant, more consumers are making their purchases from mobile devices. And, while these devices are usually clustered together, it may be time to separate them into their own categories. A recent article on CNBC discusses a study that brings to light some intriguing numbers on ecommerce. The study discovered that shoppers on PCs and tablets consistently buy products more than 3% of the time, while smartphone shoppers have yet to purchase more than 1.7% of the time. Tablet users also view about the same number of pages as PC users, while smartphone shoppers view less. What’s more, tablet traffic to ecommerce sites was greater than smartphone traffic to the same sites for the first time in quarter 1 of 2012, and PC website visits are decreasing while tablet visits increase. Essentially, the study concludes that tablets are increasing in popularity throughout the internet, especially in the ecommerce world, and they will soon overtake PCs as the go-to online shopping device. What does this mean for retailers? For one, your site better be optimized to view on all mobile devices, smartphones and tablets alike. As more Internet users do their shopping on iPads and iPhones and the like, a clunky or difficult website viewing experience will be enough for them to seek out an alternative, and you could lose customers due to your mobile ineptitude. Bluetrain Mobile created a handy Mobile Grader where you can input your website and find out how compatible it is with mobile devices, including statistics on load times and comparisons to the rest of the Internet. The grader also tells you where your site is going wrong, and how you can improve the site for mobile viewers. So, if you’ve never considered mobile shoppers and have no idea what they see when they view your site on their phone or tablet, start here. Marketers who do have a mobile website set up often check how the site looks on their smartphone, whether it be an iPhone, Droid, Galaxy or any other phone. While this is still a good idea, it might be beneficial to check out the site on a tablet, as well. Testing your site for yourself is a necessity; if you’re experiencing errors or having trouble, chances are, your customers are, too. If you’re an online retailer, these latest statistics show that you need to ensure your site runs smoothly on tablets, from home pages to checkout. Even if you don’t have a tablet yourself, odds are you know somebody with an iPad or Kindle Fire, or any one of the many tablets out there today. Look through your site on a tablet, and note any aesthetic issues or usability errors that come up, so you can fix them and create the best shopping experience possible for your customers. Ever since the launch of the iPad in early 2010, tablets have been taking the world by storm. With the upcoming release of the Microsoft Surface in October 2012, tablet online shopping will only continue to increase. Online companies must take the necessary steps to develop a shopping experience that is not just mobile friendly, but tablet friendly. Those who create an appealing mobile site will reap the benefits of heightened views and increased sales, many that will come from customers who were disappointed by a competitor’s mobile site. 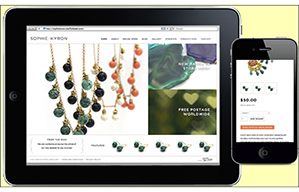 Optimize your site today, and be ready for the mobile ecommerce boom of tomorrow.